Continuity mistake: One of the tiles comes loose when Wallace is walking across the ceiling in the museum. A few seconds later, the tile is flat against the wall again. Continuity mistake: In the beginning Gromit is pouring tea and there is a teacup and toaster near the pot. Gromit sets it down, gets the mail, and then comes back. When he comes back, the cup is much further away from the teapot and the toaster is on the other side of the table. No one has been in the room since Gromit left. Trivia: "Moon cheese shares soar." is written on the newspaper that Gromit is reading at the beginning of the episode, a reference to "Wallace and Gromit: A Grand Day Out" (1989). Wallace: Ah, well, it's no use prevaricating about the bush. Wallace: They're techno-trousers, ex-NASA, fantastic for walkies. 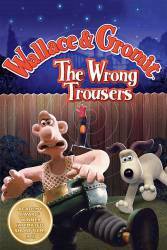 Wallace: It's the wrong trousers Gromit, and they've gone wrong. Question: How was the rain scene accomplished? Chosen answer: It was added at the edit. During the animation, the animators just made little sprinkles on the characters so it would look like the rain actually hit them.